When I first signed up for Twitter in 2009, I thought it was confusing. I wasn't completely sure how to enter conversations without being rude, and it was hard to jump back and forth to get notifications, look at a twitter chat hashtag, and try to see if anyone was mentioning me in a tweet. What kept me from running away from Twitter never to look back? Hootsuite. Hootsuite helped Twitter to make sense. I could organize streams of information, and see everything I needed all at once. Tweeting suddenly became fun. Once you learn how to use Hootsuite, you will never go back to tweeting from Twitter again. To sign up for Hootsuite, you need your name, email, and a password. Although there are paid plans available, the free option is enough for most people. You will not need to turn over any payment or credit card information if you choose to sign up for the free plan. 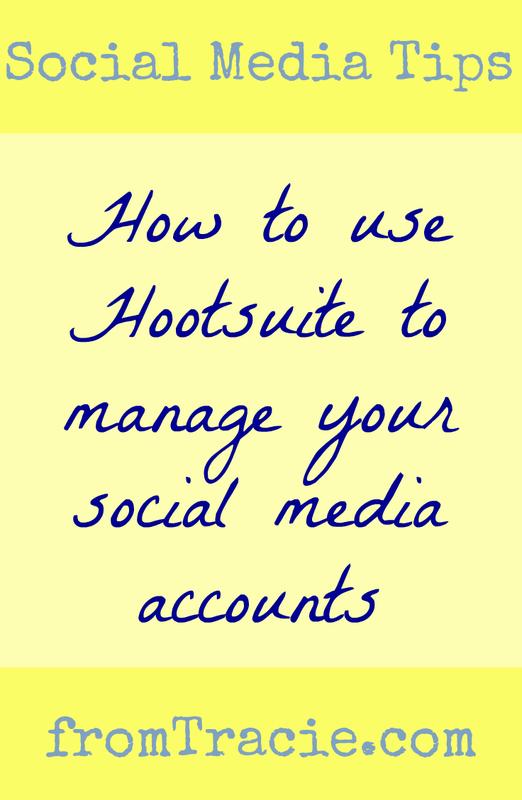 Once you log in to your new account, you will connect and authorize Hootsuite to access and post to your social media accounts. What is a stream? They are all the rows of information you can add from each social media account. I sometimes call them columns. Let's think about them in terms of Twitter: In order to tweet effectively, you need to be able to look at several different things - your @mentions, your home feed, and your direct messages. Each one of these things can be made into a stream, so you will be able to see them all easily on one screen. 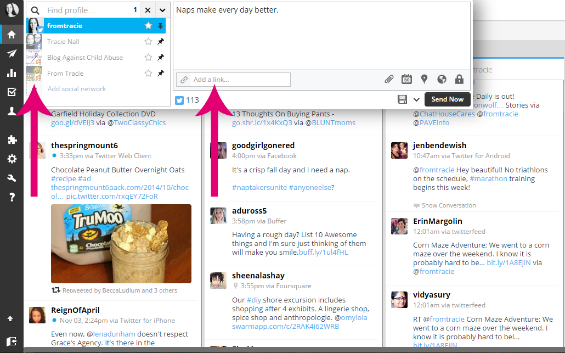 When you first visit your Hootsuite dashboard, you can edit the title of your first tab by double clicking on it. 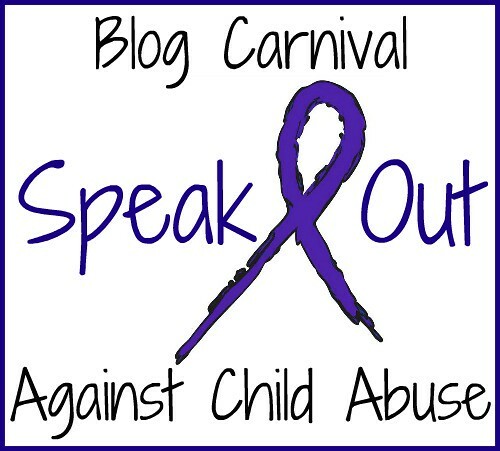 We will set up streams on a both a twitter and a facebook tab today. When you click + Add Stream, a box will pop up. You will first choose which social media profile you want to use, and then you will be given a list of options. Click on the green plus button for each stream you want to add. Most of them are self-explanatory. 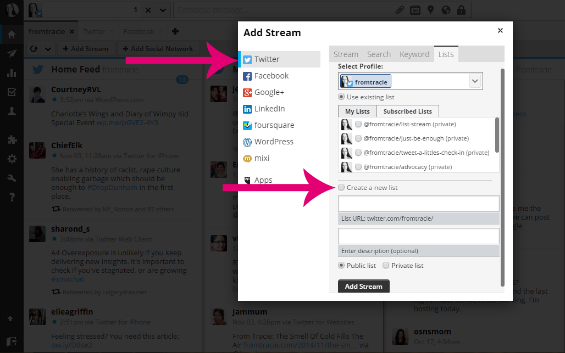 You want to start by adding your home stream, mentions, and direct messages. 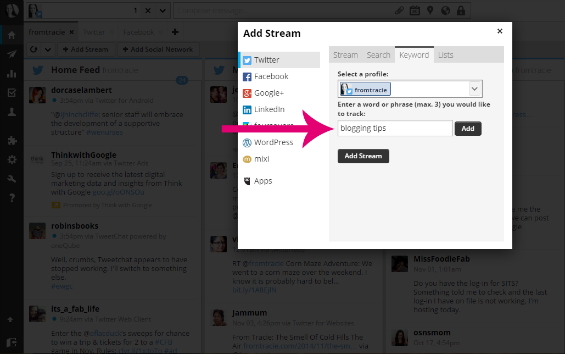 You might also want to add a stream for scheduled tweets. One you have added your basic streams, you can get more creative. In the Add Stream box, you will notice that there are tabs that offer Search, Keyword, and Lists. Click on the Lists tab, and choose the profile you want to use (Twitter). You will be able to add a stream using an existing list, a list you are subscribed to, or create a new list right there. In the Search and Keyword tabs, you can set up streams that will help you track specific words and phrases. This is great for people who are blogging in a niche, and want to follow any conversations that are happening around their main blogging topics. 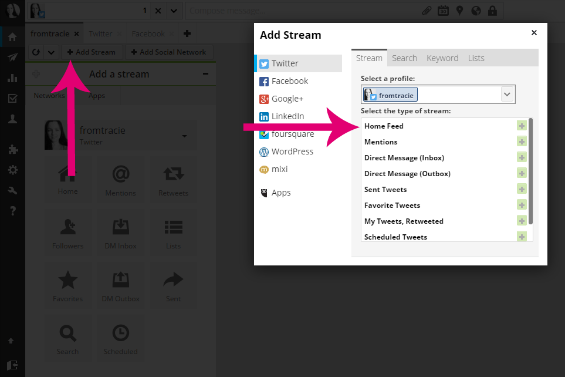 This is also where you can create a stream for any hashtags you want to regularly follow. You can add as many streams as you want on your twitter tab, but only so many of them will fit on your screen at one time. After about four streams, you will find a scroll bar added at the bottom of your screen. 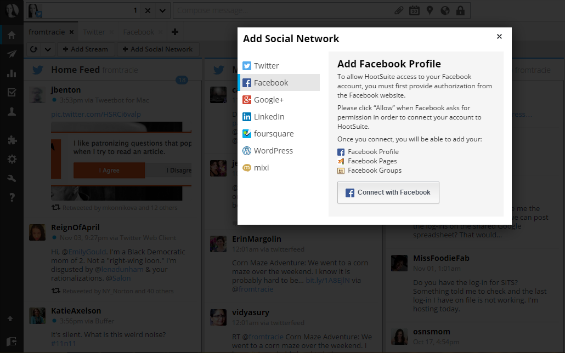 If you haven't already authorized Hoosuite to access your facebook, do so now. 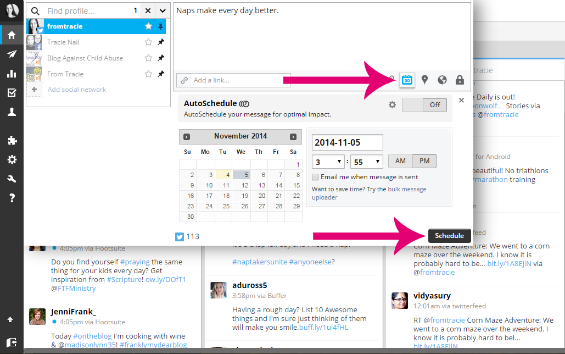 Choose which pages and groups you want to manage through Hootsuite, and finish importing. You will now be able to set up streams for facebook. The process is the same as adding twitter streams. You can create separate tabs for each page you manage, or put them all on the same page. Now that you have your dashboard set up, it is time to actually use Hootsuite. Sending out a tweet or status update is easy. Click on Compose Message at the top of your screen. On the left of the dropdown box, you will choose which profile you want to use to send this message. If you want to send it your message from multiple profiles at the same time, that is possible by selecting each desired profile, but remember that twitter only allows 140 characters. Hoosuite has a built in link shortener right below the message field. Just paste the link you want to share and click on the shrink button. It will be automatically added to your message. You can click on the gear to choose your preferred URL shortener. You can also add an image to your tweet by clicking on the paper clip button. 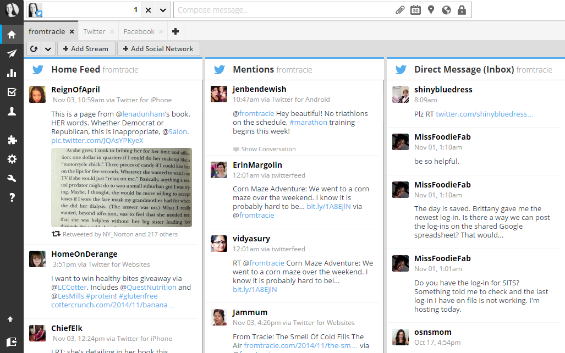 The Compose Message box is also where you will schedule tweets and status updates. Compose your message, and click on the calendar icon. Choose the date and time you want it to be shared, and click on the Schedule button. If you don't need a tweet to go out at a specific time, you can turn on the AutoSchedule option, and Hootsuite will send it out at the time Hootsuite determines it will have optimal impact. If you have several messages to schedule, you can use the Bulk Message Uploader option. 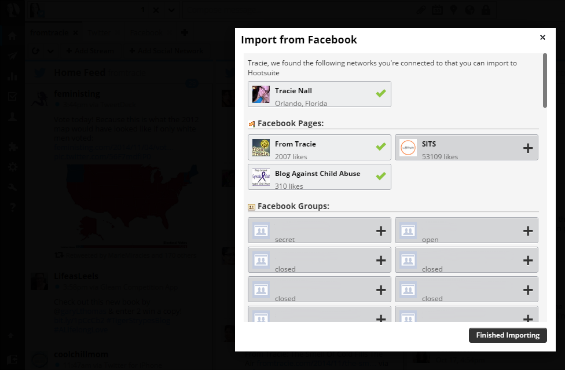 You can also schedule updates to facebook groups here. If you hover your mouse over a tweet in one of your streams, icons will pop up allowing you to respond, retweet, send a direct message, and more. 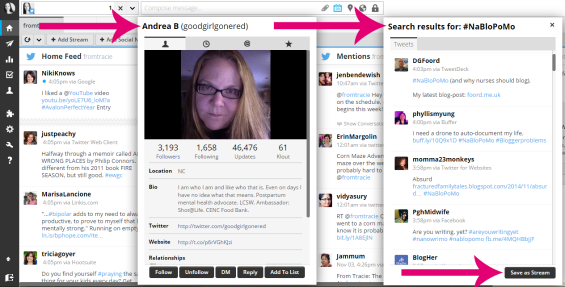 When you click on someone's twitter handle, a box will pop up. In this box you can see all of their profile information, as well as tabs that allow you to quickly see their tweets, mentions, and favorites. You can follow or unfollow a twitter user from this box as well. 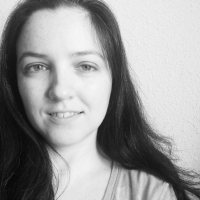 That's my awesome friend, Andrea, you see in the profile box above. If you click on a hashtag in a tweet, a box will pop up with all of the tweets using that hashtag. If you find the hashtag is something you will use often, you can easily save it as a stream. I'll be using #NaBloPoMo every day in November, so it makes sense to save it as a stream. I can easily delete that stream at the end of the month when I'm no longer monitoring the hashtag. What I love about these pop up boxes is that you can move them around the screen, and continue to access your saved streams. I often pull up a hashtag, and then want to get a closer look at the profiles of people who are using it. In Tweetdeck, you can only view one of these things at a time, and aren't able to interact with your saved streams while a profile or hashtag search is up, so this is a big win for Hootsuite. If you upgrade to the paid packages, you get access to more analytics options. 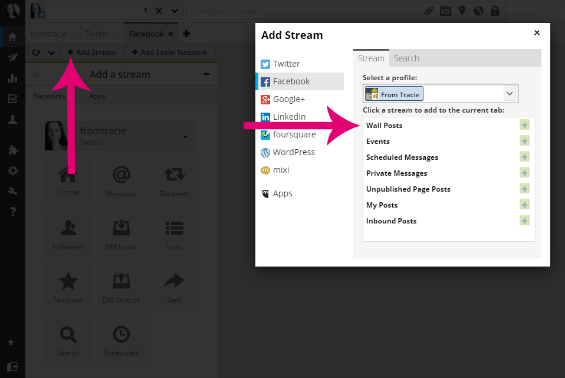 You will also have the ability to add more more social profiles, and be given advanced scheduling options. I signed up for Hootsuite a while ago but tended to use Bufferapp more. I know I need to get my Twitter and Facebook lists in order because everything is a mess right now. This sounds so helpful. Pinning to my Blogging Tips board to bookmark it. Thanks! So I need to explore Hootsuite more and definitely set up more streams. Seems like a pretty powerful tool if I gave it more of a chance. Thanks so much for this!! I've been meaning to try something like this to organize all my SM now that I've got multiple accounts. I might still have to email you for help, but this is a great start! You're making me want to start over with hootsuite. I signed up a long time ago, but never use it. I have never even heard of hootsuite...THANK YOU!!! I am hoping maybe this will help me limit my time on Facebook by just a little bit. 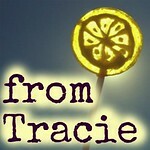 Bookmarking for later and sharing!